The weighted blanket boom that you’ve seen on Amazon over the last year can be traced back to a very successful Kickstarter for the Gravity Blanket. It wasn’t the first weighted blanket, but it was the first marketed to average consumers to help them stay cozy and combat anxiety, and now, it’s on sale on Amazon for the very first time. 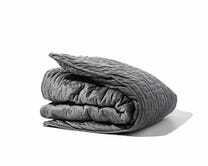 Interestingly, all three weight options cost the same $179, which is more than we’ve seen from other brands for 15 and even 20 pound blankets, but there aren’t a lot of 25 pound options out there, let alone ones that look as nice as the Gravity. It doesn’t come with a Life Alert button in case you get trapped underneath, so factor that in, but this price down from the usual $249, today only.